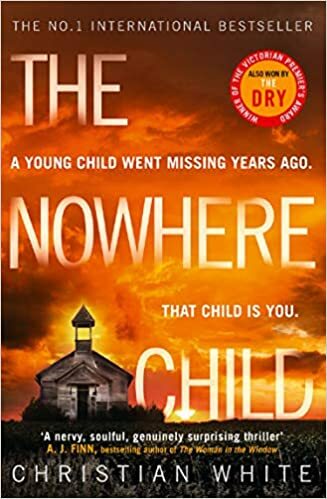 I enjoyed the start of The Nowhere Child – Christian White. Kim, an Australian photographer in her twenties, is approached by an American who believes she may have been abducted as a child from a small town in America. This is obviously nonsense isn’t it – she can’t be Sammy, can she? The only person who would be likely to be able to tell her would have been her mother however she is now dead. The Nowhere Child looks at this scenario is two time frames. The current one is the journey that Kim embarks on to try and find out the truth. The other thread is what actually went on in Manson (small town America) around the time of Sammy’s disappearance. I found the book pacey enough and easily readable. However I did find that this was maybe not the book I was expecting. “Girl discovers she was abducted as a young child – grows up a long way from home – finds out and gets to know her family and what happened.” Maybe yes and maybe no. More deeply this is perhaps about fractured families and fractured relationships and that worked for me. I enjoyed the Nowhere Child overall even if I was not blown away. Parts are quite powerful though sometimes the story seemed to lack depth oddly. If I have any real reservations about this book it would be that I did not find the characters particularly strong. Kim is good however the majority of the others seemed rather shadowy to me. I felt this was a shame as some of the people seemed interesting. It was not a book I would have stopped reading at any stage. However I have some doubts that it will remain in my memory for all that long. I’d like to read something else by this author in the future.